Report on a Lunchtime CPD talk given by Steven Turnbull on 19th June 2018.
business matters are grateful to Brodies LLP who hosted this lunchtime event and provided lunch for those attending. A recording of Steven’s talk and his PowerPoint presentation can be accessed using the links at the foot of the page. In addressing the topic of uncertainty, Steven started by outlining his own experience in setting up and running his own very successful business, only to have external circumstances of the financial crash in 2008 result in taking him “back to square 1”. He outlined the journey he has made since then, avoiding the temptation to look back and go back but rather to focus on the way ahead and on taking control of his career in a proactive way. Moving on to background from the world of psychological research, Steven outlined the 7 human needs, including certainty and also highlighted three of the main causes of uncertainty in the workplace – probability, ambiguity and complexity. Often, as a result of these factors, people enter quite a dark tunnel in their mental health with anxiety, depression and perhaps even addiction issues resulting. An interesting fact which Steven mentioned was that, out of the 60,000 thoughts which the average individual has in a day, 70% are likely to be negative, even if that person is in a good place. Worry comes naturally to us which is why it is so important to think about how to address this positively. 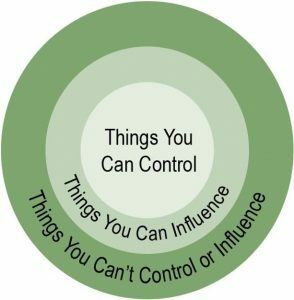 showing concentric circles representing areas of influence and control and challenged us to work and focus on the aspects that we can do something about rather than worry about something we have no influence or control over. He also challenged us to forget the “plan B, C, D” approach which tends to be self-fulfilling in a negative way but rather to take control and address the issues. For each, he produced data and evidence to support such suggestions as seeking out prebiotic and probiotic foods; sensible, achievable exercise targets and positive psychological techniques such as affirmation. After his talk, those attending were able to talk further before returning to their work potentially able to deal better with the uncertainties there.